Chisolm's Restaurant, Jenolan Caves, NSW. Information, Photos and Reviews. 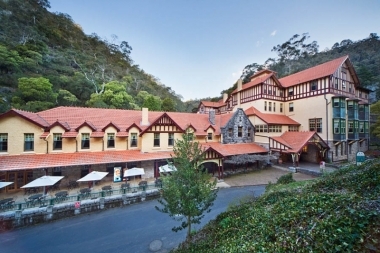 At Jenolan Caves, our heritage-listed Chisolm's Restaurant, upstairs in Caves House, is open for dinner, 7 days a week, serving 'modern Australian' cuisine. Our Head Chef leads an enthusiastic, hard-working team. Caves House hotel was designed in 1897 by Walter Liberty Vernon, in the 'Federation Arts & Crafts' style, as a retreat for the well-to-do. Vernon, Government Architect from 1890 to 1911, designed many landmark buildings, including the Art Gallery of NSW. At Caves House, Vernon's design included an enormous grand dining room, completed in 1924, now the magnificent Chisolm's Restaurant. It is one of Australia's two remaining 'grand dining rooms' from that era. Eating there is an experience in itself! To dine at Chisolm's Restaurant, you don't need to be an overnight guest. Simply drop in for a delicious dinner. Bookings are essential. Chisolm's is wonderful for a family get-together, romantic dinner for 2, family or corporate function or special occasion - even a wedding! Chisolm's Restaurant is upstairs in Caves House. Nobody has reviewed Chisolm's Restaurant yet, Be the first. You are submitting a booking enquiry. Chisolm's Restaurant will then contact you by email with details of availability and prices.